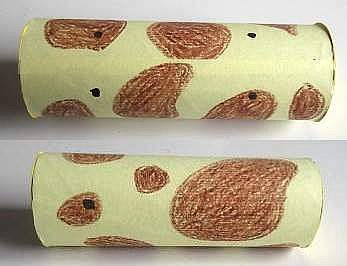 To make the giraffe`s body, cut a kitchen roll tube in half or use a toilet roll tube. 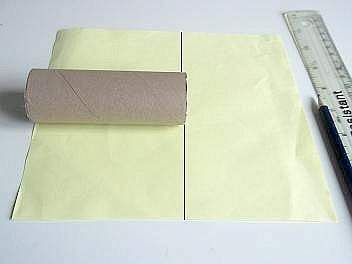 Measure and cut out a piece of yellow paper to cover it. This animal has patches all over its body so draw and colour in some curved patchy shapes using the brown crayon. 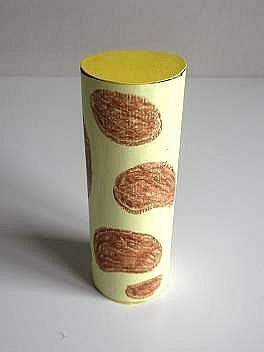 Paste the tube with a thin layer of glue and roll it up in the paper then place it near a warm radiator to dry, or in the sun if it`s a warm sunny day. 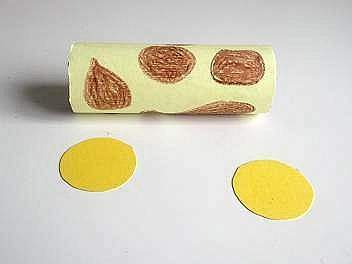 When dry, draw 2 circular outlines on the yellow card using the end of the tube, cut them out and glue to both ends. While you wait for the body to dry start making the head. 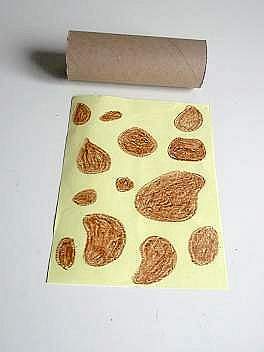 Fold a piece of yellow card about 6cm x 8cm and draw a peanut shape on it. Cut it out to make 2 pieces for the head. Keep the pieces together and draw patches on one side, then turn over and do the same to the other side. Now you can separate them. 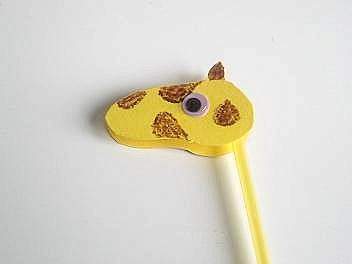 Plastic straws don`t stick well with PVA glue so paste and wrap a little piece of paper around the bendy end of the straw and then glue the head shapes to each side of it. Leave it to dry again and then stick the googly eyes in place. 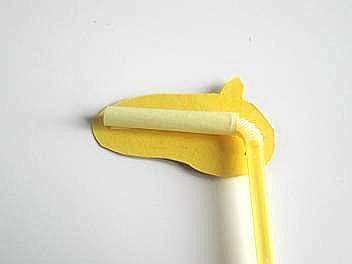 If they are not self adhesive, then use a paper nail file to ruff up the smooth back so that they bond well. 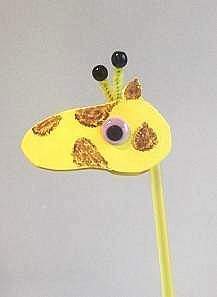 The two bobbles on the giraffes`s head are made from the small piece of pipe cleaner. 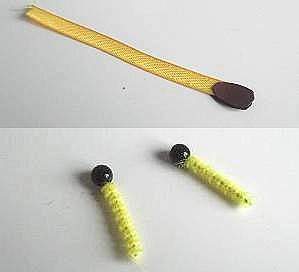 Half it in two and push the small beads onto the ends. When the head attach them to the inside. Make a tail using the ribbon with a piece of dark paper, or foam stuck to the end. Mark and pierce 4 holes in the body for the legs, turn over and pierce 1 for the neck. Make the holes smaller than the width of the straws. 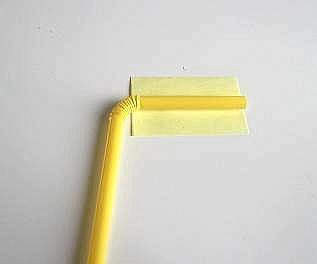 Take 4 straws for the legs and pinch the ends (not the bendy ends) to insert them into the holes. This will keep them nice and tight without using glue. Do the same for the neck. Make feet with the bendy ends and snip them shorter. Then wrap a small rubber band on each to stop the legs from slipping apart. 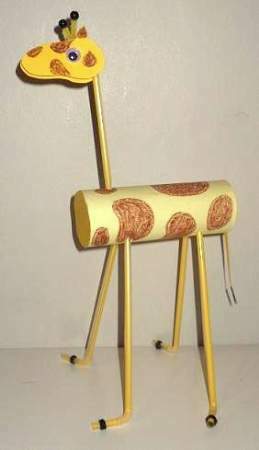 Stick on the tail and the giraffe is finished. 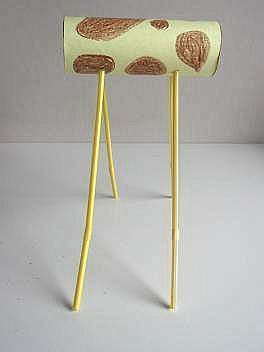 We will be adding more giraffe crafts to this page so come back soon and see how to make them!